Curb appeal refers to the way the outside of a home looks from the street. Whether on a cul-de-sac or out in the country, having a home that looks put together and inviting from the outside is extremely important. While curb appeal is a term that is often used in the real estate world concerning houses being put on the market, it is equally important for homes that aren’t for sale to have great curb appeal. When it comes to curb appeal, there are many different areas of the exterior that can be improved to make a huge impact on the overall look of the home. Every spring, many homeowners head outside and start planting, mulching, and pruning. This time spent in the garden has a huge payoff. The bright hues of flowers, precisely trimmed shrubs, and fresh, thick layers of mulch or rocks give the exterior of any home an instant upgrade. When the landscaping is done, the entire property is beautifully transformed. To successfully landscape a yard, homeowners will want to follow a few steps to get the most out of their hard work. This step is the most important step to keep landscaping looking great year-round without having to spend hours in the yard each day. To prepare the ground that will be landscaped, landscaping paper should be laid down to stop weeds from growing. Then, homeowners should edge the landscaping to make cutting the grass and doing other yard work around the landscaping easier. Lastly, they should make sure the soil is of good quality so that plants will not die. The best plants for a home will depend on many factors. The amount of sun and shade an area gets, the average rainfall, the desired upkeep, and the overall look desired are all very important things to consider. Most local nurseries and home improvement stores will carry plants that are well suited for the local climate. Homeowners will need to decide if they want annuals, which only bloom for one season, or perennials, which, in the right conditions, will return each year. After the technical part of choosing the right plants is sorted out, homeowners can move on to choosing plant colors and types. Even with extensive preparation, landscaping will need to be maintained throughout the year. Landscaping will need watered and weeded almost daily. Less frequently, it will need to be pruned and more soil, mulch, or rocks may need to be added. This constant upkeep is well worth it since the result will be a beautifully landscaped exterior. Sometimes, all a house may need is a good scrubbing to make the exterior look as good as new. But, occasionally, the exterior will need to be repainted. Painting is the most impactful way to give homes a new look. However, this new look will come with considerable costs, both financially and physically. To minimize the time and money spent to make an upgrade with paint, homeowners can choose to paint smaller portions of the home. Whether painting the entire home or just a few accents, new paint is sure to skyrocket a home’s curb appeal. Painting the entire exterior of a home is a huge job, even with a small home. Many homeowners choose to call in professionals, but painting a home can be done alone. It’s important to choose the right kind of paint and application method depending on the material of the home’s exterior. Homeowners should also consider the color of the home and choose colors that will work well with the home’s surroundings. While painting the entire home can be a lot of work, the result is well worth it. Homeowners looking for a smaller job that will still have a huge impact can just paint their front door. Most front doors are purchased in neutral colors and are never painted, which make them look drab and dingy over the years. Painting the front door with a bright paint that stands out from the home but still works with the color scheme can transform the look of a home. From the curb, eyes will be drawn to this bright focal point and away from other parts of the home that may not be as new-looking. For an even smaller job than the front door, homeowners can paint small accents around the exterior of the home. Some small accents that can be painted are the mailbox, shutters, metal awnings, stairs, and handrails. By giving these small pieces a fresh coat of paint, the entire home will look cleaner and well-maintained. These are often the most overlooked portion of an outdoor area. Sidewalks and driveways are utilitarian rather than decorative, so they are often ignored. Also, they can be one of the most expensive parts of a home’s exterior to improve or replace. But, oftentimes, sidewalks and driveways just need a little bit of attention and some elbow grease to get them looking as good as new. Nothing diminishes the look of a sidewalk, walkway, or driveway more than weeds. They seem to find every crack and crevice in the pavement and grow like, well, weeds. To rid these areas of weeds, homeowners can pull weeds when they emerge or spray the area with herbicides. Both methods have their pros and cons. Pulling weeds can be cumbersome and weeds often return quickly. Using weed killers isn’t the best choice for those concerned about the environment and, when sprayed indiscriminately, they can kill unintended plants. Whichever method is chosen, having weed-free pavement will greatly increase curb appeal. Small cracks and holes in driveways and walkways can be repaired easily using pavement repair products from a home improvement store. Blacktop, brick, concrete, and many other materials can be repaired quickly, even by inexperienced homeowners. Replacing missing bricks or filling in potholes will make the exterior look well maintained, stop the issue from getting worse, and decreases the risk of someone being injured by an uneven walkway. These small repairs to sidewalks, driveways, and walkways give homeowners a great result without putting in a lot of time, money, or effort. A quick and easy way to make driveways and walkways look more finished is to add lighting. There are many options when it comes to outdoor path lighting. Individual solar lights are a popular choice that require very little effort to install. Homeowners may also choose waterproof rope lights, which can be installed along the edging of walkways. There are many other options for path lighting, and each one will make the outside of the home look incredible, especially at night. When it comes to outdoor décor, there are so many options to choose from. Just like the inside of the home, the outside deserves to be decorated beautifully in the homeowner’s style. Decorating the outside of a home with small accents makes it look more put together and welcoming. There are many ways to use décor outside of the home, and each one will set the home apart from everyone else in the neighborhood. Even homeowners who do not normally have decorations outside of their home will often decorate for holidays or seasons. These decorations are specific to a certain time of year and may include lights, lawn ornaments, or wreaths. Decorating for the seasons is a great way to change the look of a home’s exterior throughout the year. Though there are many choices when it comes to outdoor décor, sometimes using elements from inside the house can make the exterior look warm and inviting. Things like plush blankets, comfortable pillows, table centerpieces, and pictures in frames can turn an underutilized covered porch into an extension of the home. If these items are kept away from rain and aren’t in danger of blowing away, they can make an outdoor space look and feel much more comfortable. Since the outside of a home is the home’s first impression, it’s also the owner’s first impression. By using items that express the owner’s personal style, the home will stand out and have a unique curb appeal. Some ways to express unique style outside of the home are by using specially made items rather than big box store goods. Some popular items are personalized signs, funny or inspiring quote plaques, and tongue in cheek welcome mats. There are many other ways to express personal style outside of the home to make the exterior more unique and well suited to the owners. The outside of a home is the home’s first impression and will set the expectations for the rest of the house. If the exterior of a home looks dilapidated and unkempt, it will be assumed that the interior of the home will be in poor shape, as well. Whether homeowners are looking to spend their entire summer working on curb appeal or are just looking for a weekend project, there are many things they can do to beautify the outside of their home so their house can make a great first impression. Parents get really excited for their newborn babies. Before you even select the color of the nursery room, you need to see the space first and see how you can use natural light to make the room look much brighter. You would want the nursery room to look spacious and comfortable for your baby. Using dark colors makes the room look much smaller than it appears to be. What is the best color for your baby’s nursery room? When you are designing a nursery, there are different factors that you need to consider when it comes to choosing the color and designing the space. If your baby is a boy you can use the traditional blue color or if it is a baby girl, you can use pink. If you are tired of using the usual colors, you can always play with them and be more creative. For instance, you can also use a neutral color (i.e. white) then you can add another second color like blue. You may also want to add an accent wall as well as the use of a nicely designed wall paper. One of the things that you usually notice in smaller rooms is that they have accent walls. This is because adding accent color can make a room appear much bigger and adds more depth. Just choose the accent walls that will perfectly complement the theme. For instance, if you want a Superman theme for your baby boy, you may want to add a mural of other heroes. Add the colors of these super heroes into the pillows, blankets, sheets, etc. You would not want to keep on redoing a nursery room. So, it is a practical choice to use a color that you know will last. For example, you may want to go for mint green or navy blue. These colors are perfect for a room that is non-gender specific. Another main advantage is that you can still use this color for years to come. Colors directly and indirectly affect moods of people and the same thing goes for kids. As such, it is strongly recommended that you use soothing colors for your baby. Choosing the right color will surely improve their sleeping and can make their mood much better. You should not use too bright of a red, yellow or orange as these colors are often associated with too much energy. You can use these colors but only to specific areas. You may want to have pastel colors where you will put the crib or where your baby will sleep. Is the paint on your outside walls starting to peel away? This can definitely affect the overall look of your house. So, why does paint just fail or if they work the first time it does not last? There are reasons why this is the case. Whether it is painting for interior or exterior, you need to know the reasons why it peels away so you can take the appropriate precautions and actions to fix it. You don’t want to waste your money and keep on redoing the paint every time it peels away. One of the main factors that cause any paint to peel away is brought about by moisture. When there is condensation and it is starting to build up, paint will start to peel off from the wall. This usually happens to areas where there is no exhaust fan or even if there is it is not working properly like for instance bathrooms. Rain can also cause moisture which can result to cracking or peeling of the paint. That is why you often see roof corners and wood boards where the paint fails. Exterior paint is specially designed to withstand weather elements unlike interior paint. Exterior paint can at least withstand sunlight, dust or rain. What happens when you use interior paint for exterior areas or surfaces? The result is that the paint will flake away simply because this is not the right paint to use on exterior surfaces. When doing any painting job, it is important that you paint on a clean surface especially when you are painting the exterior walls of your house. Prior to your painting, you can use a power washer to clean any dirt that could mix in with the paint. This is very essential and even if the wall appears to be clean under the naked eye, you can never be sure if it is completely clean. Just to be sure, you can check it and if you see rippled areas or any dirt build-up, you should clean. 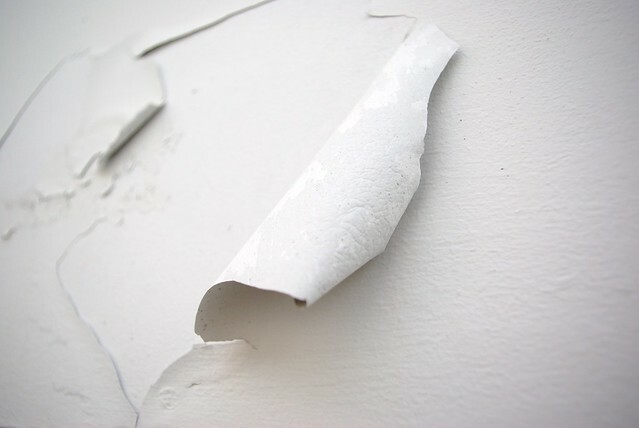 If you happen to live in highly humid and relatively hot areas, it can result to the paint peeling away. During summer especially when it is really hot, you notice that when you are painting the exterior surface you experience having dried paint or even blisters. To avoid experiencing this problem, it is strongly recommended that you paint in the morning or in the afternoon when the temperature is not so hot.